It was a rainy day and I was craving some comfort food for lunch in my neighborhood. The first idea popped into my head was the Ramenman. But I decided to refuse to wait in line in the rain. 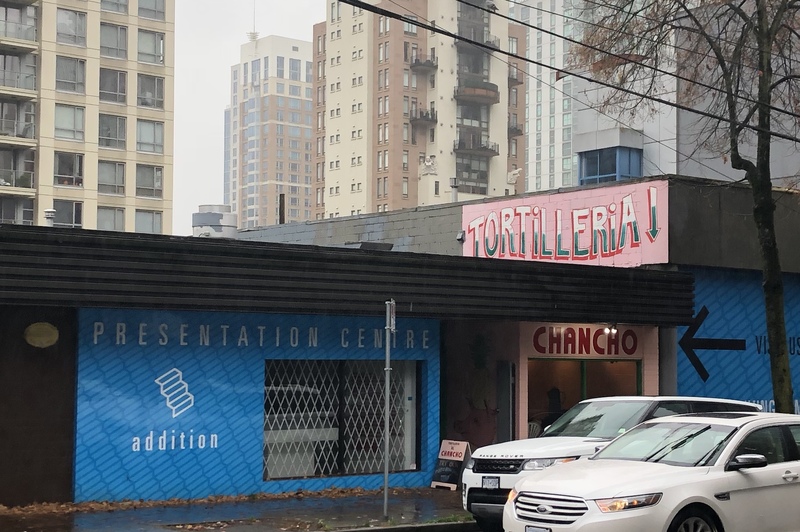 When I started walking up the hill on Davie, I saw Chancho around the corner from the ramen shop. Yes, tacos are comforting enough, I thought. The place was pretty small inside, but it looked pretty modern and clean. 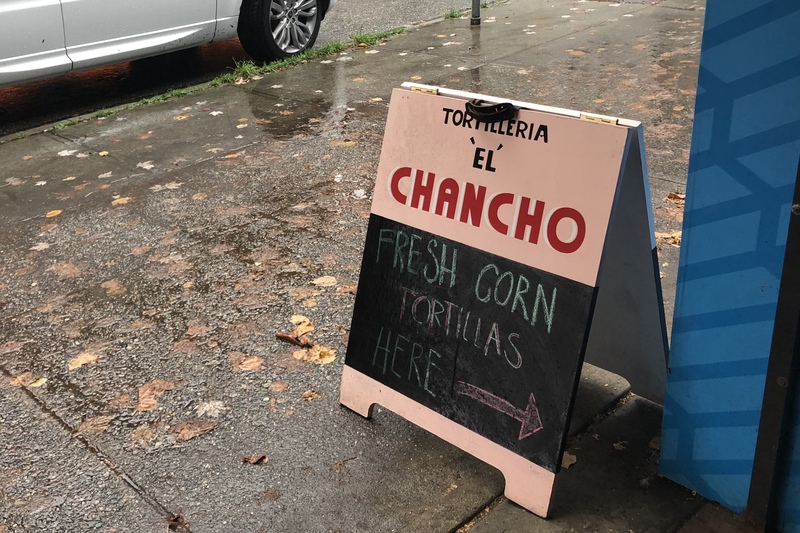 The menu looked pretty straightforward for a typical taqueria, a few meat options, and a couple of vegetarian options, plus some staple sides like guacamole and pinto bean soup. 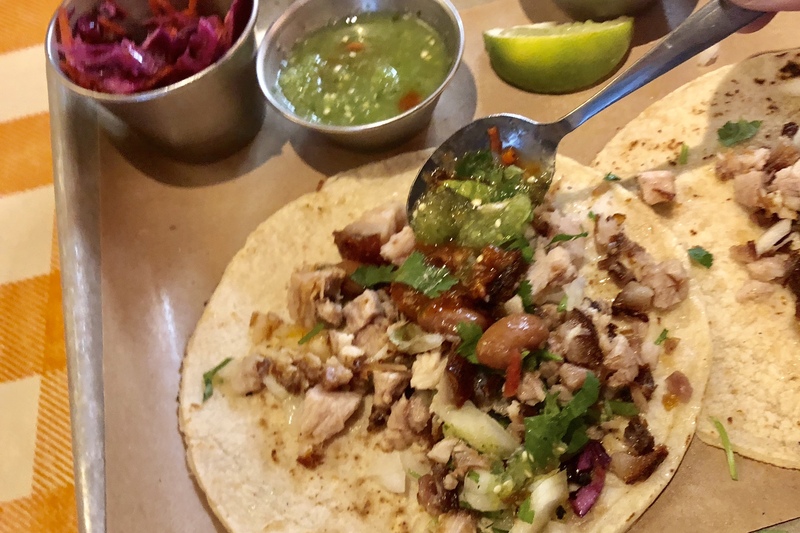 The tacos are ordered by the amount of the fillings, carnitas or vegetarianos, in the options of 1/4 lb, 1/2 lb, and 1 lb. So it’s definitely a better deal to come here with 1 or 2 friends to share the bigger portions. 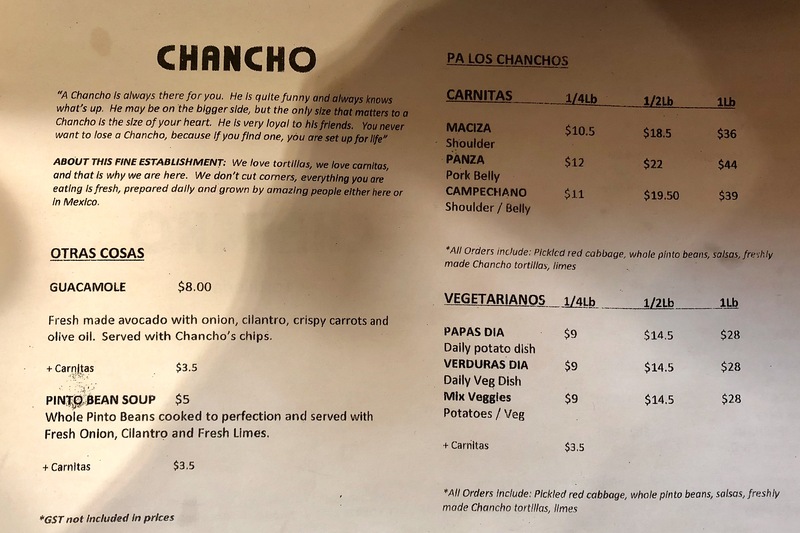 I ordered the 1/4 lb of the Panza, or the pork belly ($10.50). 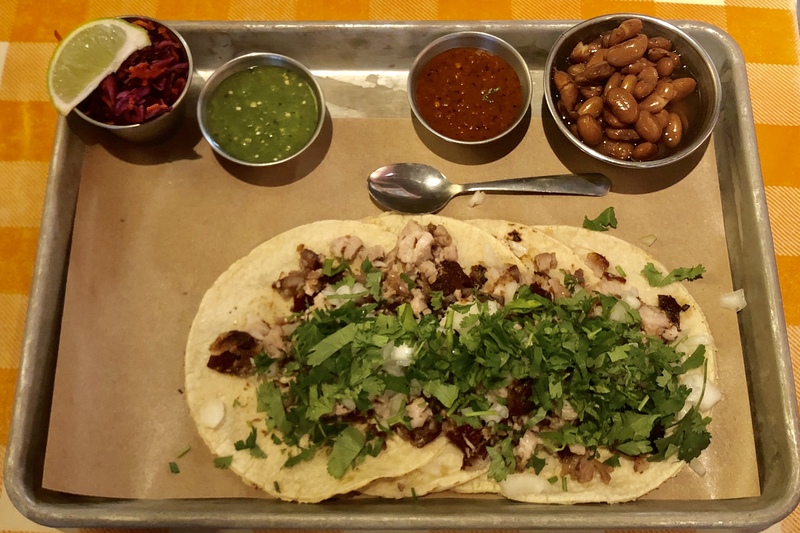 The whole serving come with pickled red cabbage, whole pinto beans, and 2 types of fresh salsa. 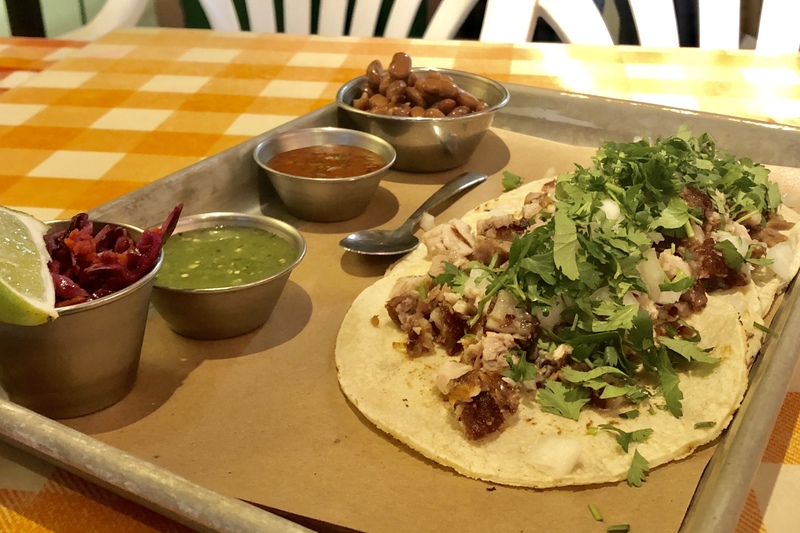 The finely chopped roasted pork belly was piled on top of 4 corn flour tortillas and topped with a generous amount of chopped onions and cilantro. With a squeeze of lime, I started to assemble my taco with all the different condiments. This is fun! The amount of food was good enough for 4 big taco. The meat was great. With the crispy pork skin chopped into the meat as well, there were different textures and flavours and it was totally a party in the mouth. This is very similar to the sandwich at the popular Meat & Bread. Both salsas, which I assumed, made from tomatillos for the green one and from tomatoes for the red, were boldly flavourful. 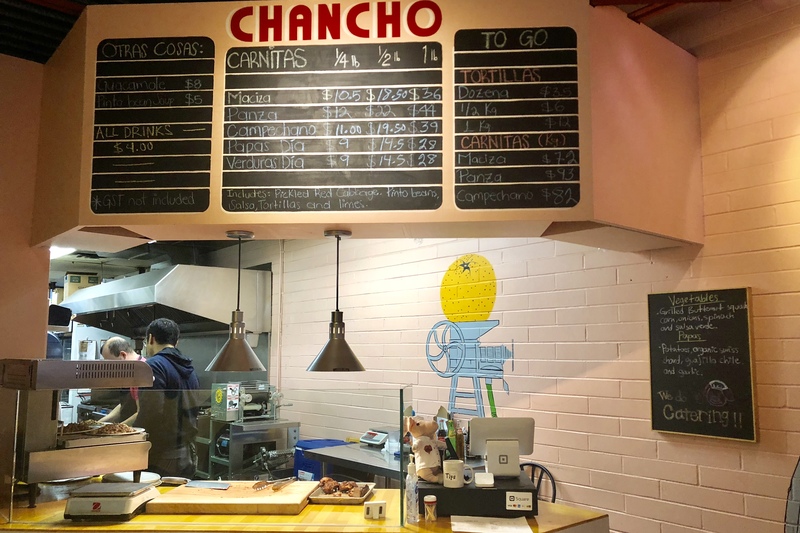 To me, Chancho is a taqueria version of the popular Meat & Bread, which should be known as the Carnitas & Tortillas. 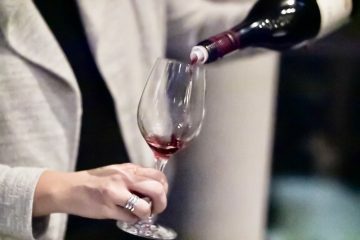 The simple menu with the only few options ensures their focus on doing one thing so well, delivering the flavourful roasted pork, which makes them so darn good. 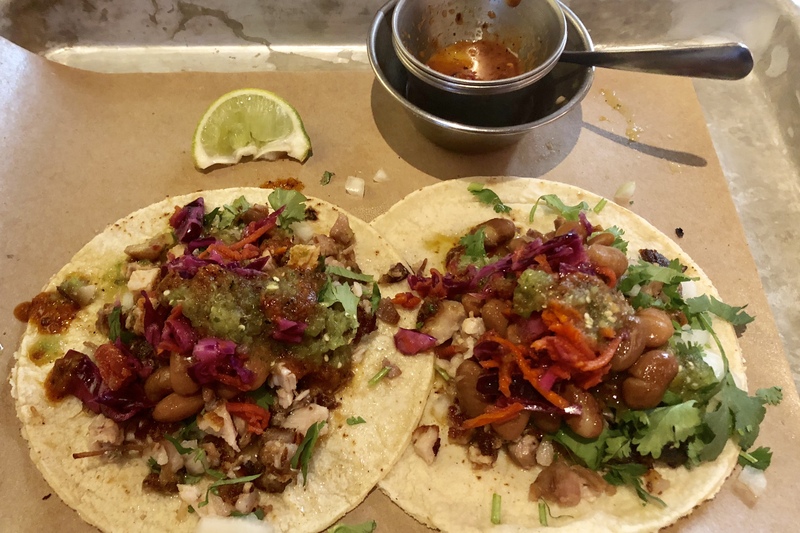 Everything else here is great too – the corn flour tortillas, the fresh vegetable ingredients, and all the condiments including fresh salsa, whole pinto beans, pickled red cabbage, and hot sauce. Like the Ramenman, they are located at a block that’s going to be redeveloped. I really hope we get to see the joint stay as long as possible.